After the success of the “Vintage Scarf Ends” collection, we decided to create another scarf end collection but instead of vintage designs we used different flower motifs. There are 12 different designs and each design comes in two different sizes. There are also 13 different individual designs to add to your scarves. 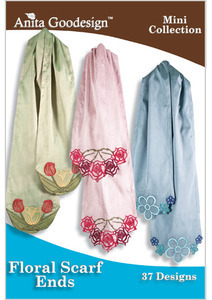 Instead of a scarf project you can also embroider tea towels that would be a perfect accessory to brighten your kitchen or bath. The projects are very easy to create and work with virtually any fabric type.